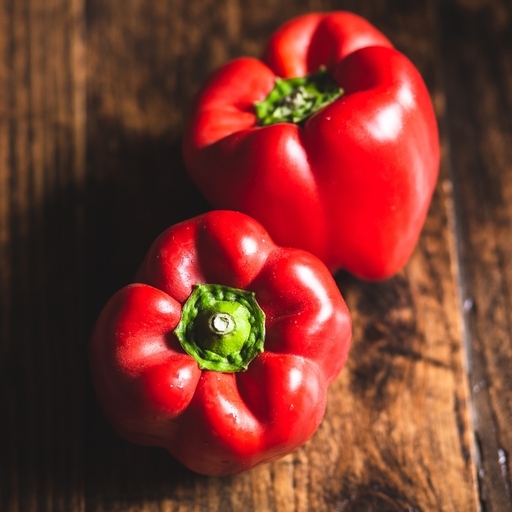 These organic red peppers are sweet, crunchy and very versatile. They’ll add crunch to salads, colour to stir fries and smoky sweetness to a plate of roasted veg. Local isn’t always best! Peppers’ homegrown season falls in late summer, though they’re a customer favourite year-round. When our own pepper season is over, we truck over naturally sun-ripened ones from organic growers in Spain. This uses just a fraction of the carbon compared with growing them in the UK using heat. Keep them in the fridge. They can last up to 2 weeks. The UK season spans the warmer summer months – July to September. Cantelo Nursery in Yeovil grow peppers for us without artificial heat, in the natural UK season between July and September. We also grow them on our farm in the French Vendée. For the rest of the year, we meet the demand from our grower Paco Locano in Spain, who also grows tomatoes for us.